The keyboard has been silent. It’s Labor Day weekend and many are enjoying their time camping, fishing, boating and the like for the season. That’s something we never did manage to squeeze in this summer. Our summer was spent locally and of course, in Denver since Simon’s birth. The bulk of the warm season I remained confined to the couch, which was bed-rest central. With germs finally coming to a rest, I’m anticipating seeing Simon this week. Unfortunately I won’t be able to just stay and spend my time with our little guy each day. This trip will have to be a short one, much to my dismay. I definitely can’t picture not seeing Simon for two weeks. I’m still feeling well enough (tonight at least!) to make the trip down. Rob, on the other hand, is still feeling trapped under sniffle clouds. Jaden seems to be doing much better, in his rambunctious way. We have been working on reorganizing our two-bedroom space to make room for Simon and all of his belongings. The crib has been set up, our room rearranged and today, Jaden moved from a full-sized bed into a twin, making room for a changing table. 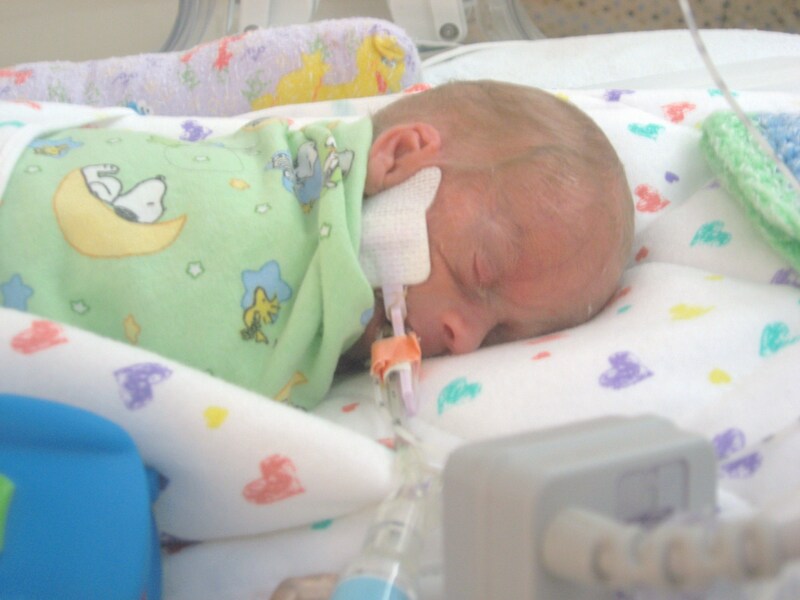 I can’t believe how our world has transformed with learning of Simon and through his premature birth. Our morning was peaceful. We made the trip out to church and spoke with the Pastor’s who have diligently prayed for Simon since learning of his arrival. I took pictures for them and listened as today’s services pertained to Love and releasing control. The message was quite powerful and in ways, ironic given our situation. I was left to reflect a great deal about Simon. As parents, we are able to control the environment in which our children are raised. We make the choices to what exposure they receive, bedding, diapers, breast feeding, formula and many more. Carefully we map out the days events for our children, play groups, educational toys and materials, meals and schedules. All of this is to control the world surrounding our children with their best interests at heart. With Simon being cared for round the clock, we have no say in anything that goes on in his day-to-day activities. We made the choice for him to have breast milk over formula, but in all reality, we are at the mercy of the medical personnel that care each hour of each day for our special miracle. As we have relinquished control, all that is left is love. Loving Simon has been easy since prior to knowing if he was a boy or girl. Loving him is an honor in my eyes, just as loving Jaden has been for four years. Never a day goes by that I’m not eternally grateful for both of my boys – special and unique. Yesterday I had the blessed opportunity to record a spot for Merge 98 FM with two friends and freelance writers. The discussion about Simon will air Thursday during the 7 PM EST show. Emcee and Owner, Tin Can, was gracious to our cause. He has included a link on his site to Simon. I will never forget the time spent with Tin Can discussing Simon. Simon is doing well. He gained 10 grams yesterday bringing him to 875. I’m guessing Simon dropped a great deal of that weight today when his day nurse managed to catch the massive blow-out he gave. I have a sneaking suspicion that Simon will continue to offer blow-outs when he comes home. We will definitely need to be prepared for that! Simon’s respiration rate has been dropped over the last couple of days, and so far, he’s tolerated the changes well. He’s begun breathing more on his own and relying a bit less on the machine. Simon has gone from 33 resps per minute down to 28. That’s a great step in the right direction for our Champ. All in all, we’ve had a blissfully busy, but fantastic weekend. We couldn’t as for much more – other than holding Simon in our arms. I’ve been bummed that my little guy has no clothes. Simon is wrapped in blankets, but clothes that small are impossible to find. I set out with a mission to make something wearable for our Champ. First I started with a pink sheet and drew, marked and measured in many different directions to come up with a general idea of what a pattern that size would entail. About 10 pm last night, I had finished the micro-sized gown and was proud of the accomplishment. 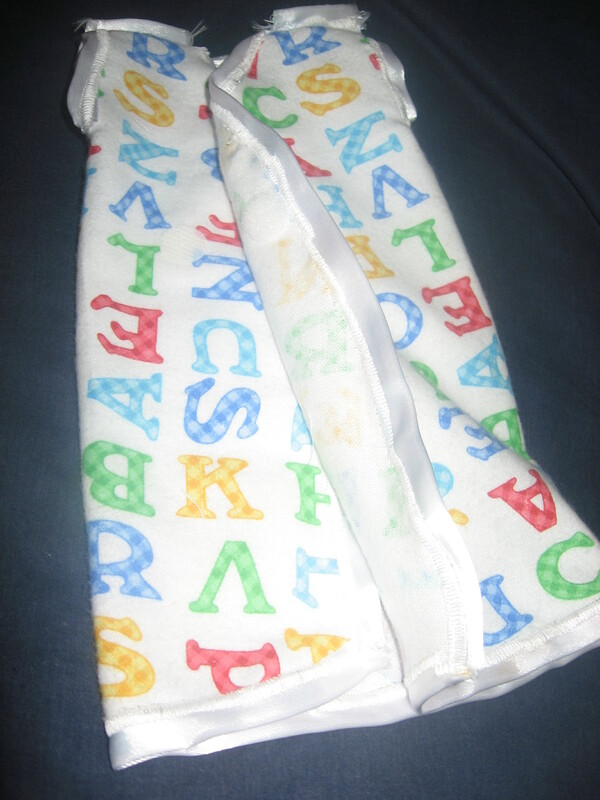 This morning I picked up fabric with an adorable ABC’s pattern and brown paper sacks. When I returned home I cut the paper sack open and laid the fabric template on that and traced out the pattern. I cut it out and cut a small square out of the fabric and laid the pattern on. I made a few adjustments as needed by sight and cut out the fabric. I took a half-inch white satin ribbon, folded in half around the fabric and pinned it in place to sew. I also placed velcro pieces on each shoulder and on the body of the gown. I had a few hiccups along the way, but finally managed to get the job done. I’m pleased with the results considering I started with nothing but an idea in my mind. I’m extremely happy that Simon now has clothing to wear even though I don’t expect him to remain in it for long. At least it is a start! 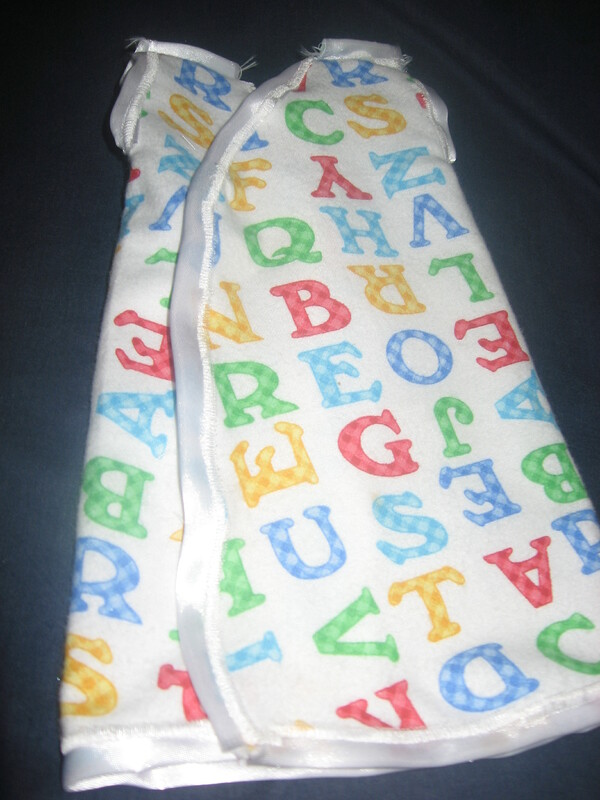 My next sewing project for Simon will be a blanket and hat (should I be able to figure that one out without a pattern!) to match. It’s been a fairly good week with some positive changes for Simon. He’s gaining weight, growing bigger and is even eating a bit more (gavage feedings.) I’m pleased that he’s in a coasting mode right now with no big changes one way or another. We are approaching 1 kilo with every ounce he gains and that will be the beginnings of steroids and hopefully weaning back off the ventilator. I’m feeling a bit better emotionally after my breakdown. I definitely needed the chance to let it out and let it go. Sometimes the most challenging of emotions are the hardest to release… They were for me. Today is Simon’s month-birthday! Can you believe it?? He is truly a month old! With no news being good news, I can say that no new updates is a good thing tonight!! In light of that, I’ll offer a few statistical tidbits to mark the celebration. They changed over Simon’s feeding tube today to one that sits in is intestines hoping that not having anything in his stomach to press against his diaphragm will help with the oxygen desaturations and Brady episodes. He didn’t gain or lose any weight, still at 885 grams. He did have a serious Brady episodes today, followed by a couple mild episodes, which is why the changes. 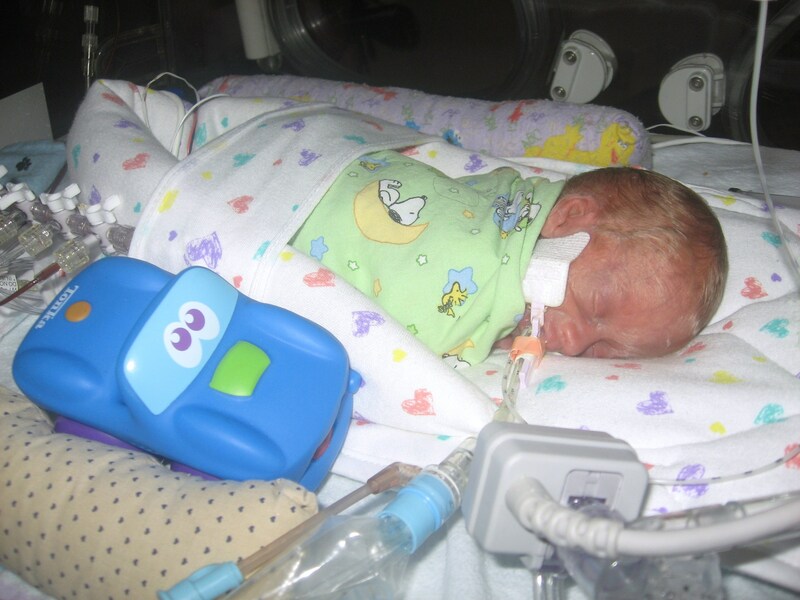 His feeding tube will have 5mL of breast milk pushed through it every hour. It happened today, something I knew could eventually occur given the circumstances we face and my own medical history. I lost it. This process has been very emotionally draining. I’m not talking about since Simon was born, but before too. Being on bed rest, never having the opportunity to grieve not having a healthy pregnancy, stressing over our little man’s life before birth and losing my sense of self with no longer being able to provide for my family was a huge challenge for me. While pregnant, I stood challenged emotionally trying to cope with the problems that now seem minuscule in some respects. Since Simon’s birth, life has become even more of a challenge. Trying to juggle finances so that traveling to Denver is a possibility, working on turning our home into an organized place fit for housing the four of us, and trying desperately to cope with the feelings of inadequacy as a mother each and every day has brought with it an amazing burden that resides on my shoulders. It’s too much for be to handle, though I’ve tried! Today, while working on the mass amounts of laundry, I pulled a load of blacks and reds out of the dryer to find that my shirts had ink on them that came from pens in a pair of Rob’s pants. I became instantly emotional while talking with Simon’s nurse. When I got off the phone with her, I snapped at Rob. I finished folding clothes that were not ink ridden and got them away. I took a shower so I could cry. I couldn’t even do that right and was disrupted with Jaden’s most irritating whining cry. I tried to get him to come into the bathroom so I could find out what was wrong and he started getting louder. At that point I got out of the shower, giving up on the solitude I needed to just cry. I then moved to Jaden’s room and asked what the problem was and he wouldn’t talk in legible terms so I snapped at him. I walked into the bedroom and slammed the door. Maybe I should have just stayed there in my own self-imposed time-out. I didn’t however. I came out of the bedroom and walked into the kitchen to see dishes sitting in the sink instead of in the dish washer with the other dirty dishes and walked out. I walked back to Jaden’s room and pitched a fit about the disasterous pit there. I told Jaden if he didn’t get up and start picking up his toys I would throw them all away. After he rolled his eyes at me, I began picking up toys in the doorway, including a prized Omnitrix from Ben10 and told him they would go in the garbage and he needed to get his room done or the rest would too. Mind you, I was far from calm and rational at that point and was yelling. When I came back out to the living room, Rob told me to go away, go somewhere to cool off and come back when I was better. I know myself well enough to know that driving when I’m feeling this way is not a positive experience and I just don’t pay attention at all. I avoid driving during times like this partly because I turn into a road-raged woman. Instead I walked outside and came in a few minutes later, walked into the bedroom, shut the door, turned out the light and flopped onto the bed. Solitude to cry and take the time out so desperately needed. It didn’t last long though. Rob came in and asked if I wanted to talk. I tried to explain what it was that set me off to begin with. I told him that the ink on clothes and having a discussion about vent tubing, steroids and changes with Simon was just too much at the same time. I wasn’t even angry that there was ink on the clothes it was the sheer fact that I was angry because I was angry about the clothes. Clothes are an ignorant item to be angry when ruined. Life is more important. When I tried to explain myself further I hit a brick wall, gave up and Rob left. I knew that there would be major ups and downs given the circumstances. Little did I know today would be the day for a breakdown when I awoke. As a family, we are well aware of the ramifications of simple viruses and their possible detriment to Simon. With Jaden catching a cold and laryngitis subsequently, Rob and I have been really watching our own bodies to see if any signs and symptoms were surfacing. This morning we are both seeing the beginnings of a nasty little virus plaguing our lives. We intended on traveling down to see Simon tomorrow, but are leaning more towards staying home – just to be safe. Simon has been fighting his own viruses with a bladder/kidney culture coming back positive. He was started on antibiotics Friday and those ended yesterday with everything returning to normal status. We have no signs of a bug through all of his lab work. It seems the little guy is on the mend that way – and more! Simon’s feedings will increase tonight to 9mL every 2 hours, taking him to 108mL or roughly 3.5 ounces per day of breast milk. His milk has been fortified with calories to assist him in gaining weight. He’s still receiving caffeine orally. Our little guy gained 50 grams yesterday, taking him to 885 grams or 1 pound, 14 ounces! He’s just 25 grams shy of our benchmark weight of two pounds!! Simon’s oxygen levels are still running between 40 and 50 percent, hopefully to see those decreasing soon back into the 30’s. As a size perspective ratio, I want to share with you a picture of diapers. 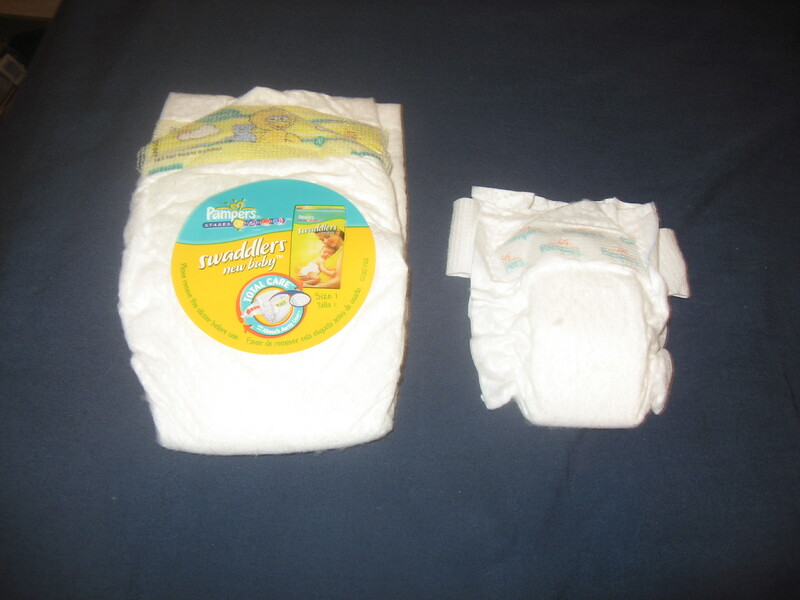 The larger of the two is a size 1 diaper and the one next to it is a diaper from a package that Simon wears currently. 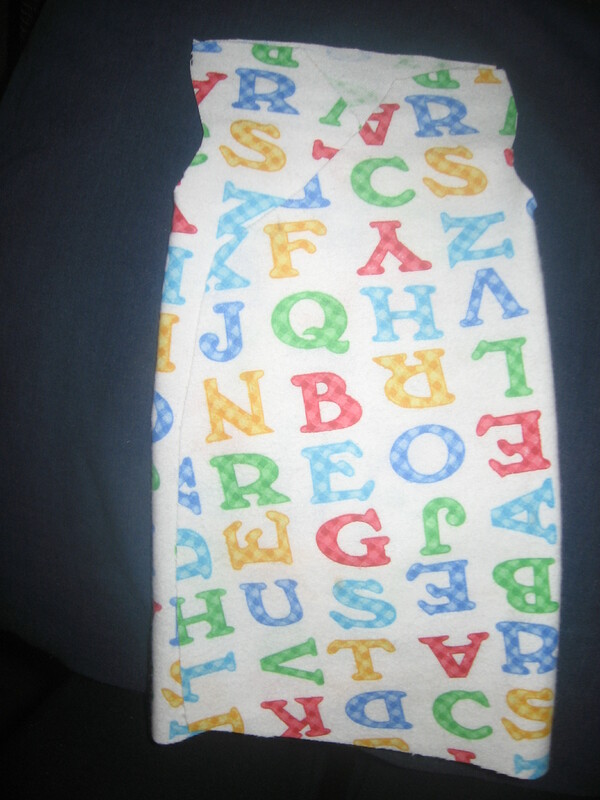 This diaper is still too large for Simon and when folded is about the same length as a AA battery. In light of the fabulous news, I’ve opted to share some special photos taken while visiting Simon with Nana and Papa Sunday. Our little man is growing up and growing stronger. Hiccups are a spasmodic contraction of the diaphragm. A common occurrence in life, though unpleasant when their end seems nowhere in sight. Hiccups can be caused by many different sources, however in preemies, hiccups are a sign of distress. What seemingly normal events for you and I are far more intense and show different signs for the wee little ones. Watching Simon in my visits I’ve experienced watching him hiccup. Most generally those hiccups were a precursor to serious desaturation and Brady episodes. Knowing the signs and watching patterns show when a problem is on the rise. Watching and journaling Simon’s experiences in the NICU have shown a distinct pattern to his little hiccups on the road. Simon is four-weeks-old and negative twelve weeks in gestation. He hit a hiccup in his journey Friday evening. Desaturating began about 4:30 that evening and by 6:30 he was having many Brady episodes. His lab holiday came to an abrupt end with numerous tests and cultures needing done. Oxygen levels shot up from the 30-40 range into the 70’s. 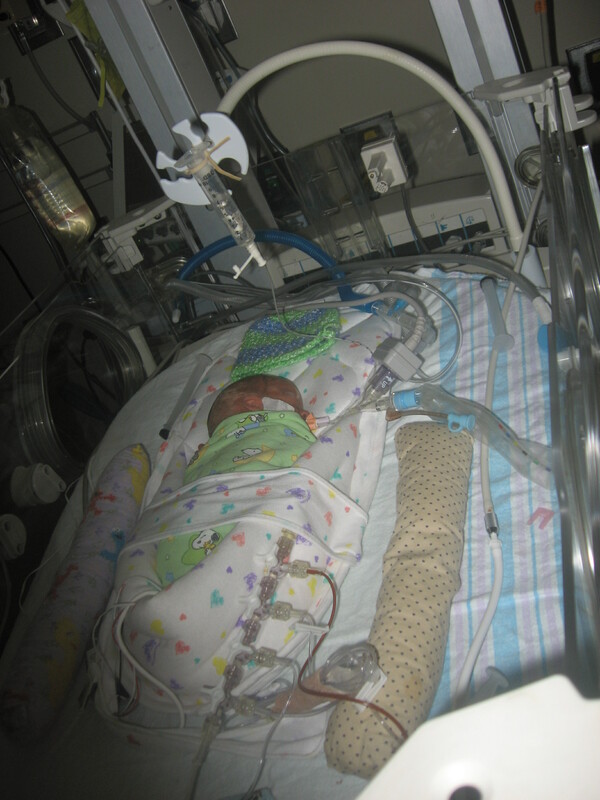 Changes were made to his ventilation tubing that would better accommodate his fighting body. Simon was started on two antibiotics and through all of this, his intestines and digestion continued, allowing him the opportunity to receive gavage feedings. This is the one area that remained strong, allowing for steps forward. As the days have cycled between sun and moon since the difficult call on Friday, Simon has showed some little improvements along the way. His caffeine was changed from IV to oral dosing, feedings increased and his oxygen levels have come down, bit by bit. We would expect, with the sudden breathing challenges, that Simon would have a lung infection of some sort. That isn’t the case, however. His cultures came back good in that region of his little body. Instead, Simon is fighting a bladder/kidney infection. His current course of antibiotics will be run for seven days. 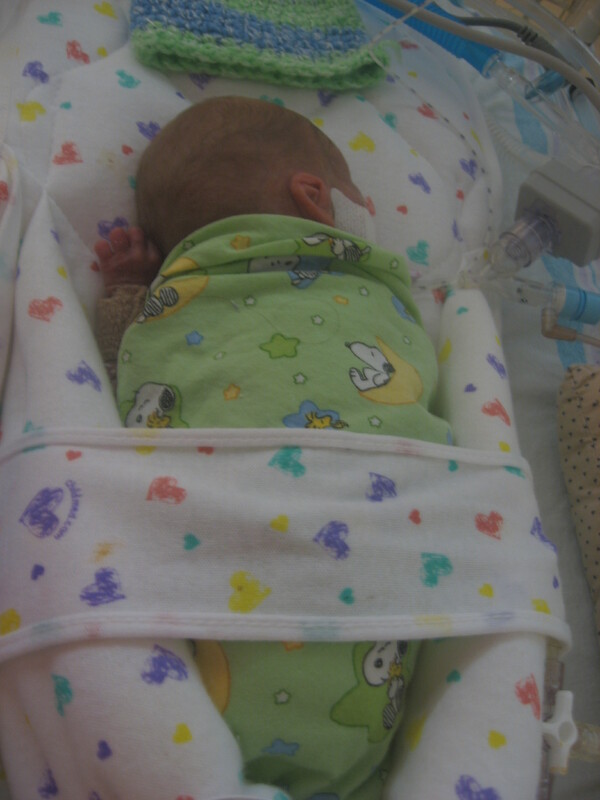 Simon has gained weight through this process, currently residing at 1 lb 12 oz or 835 grams. 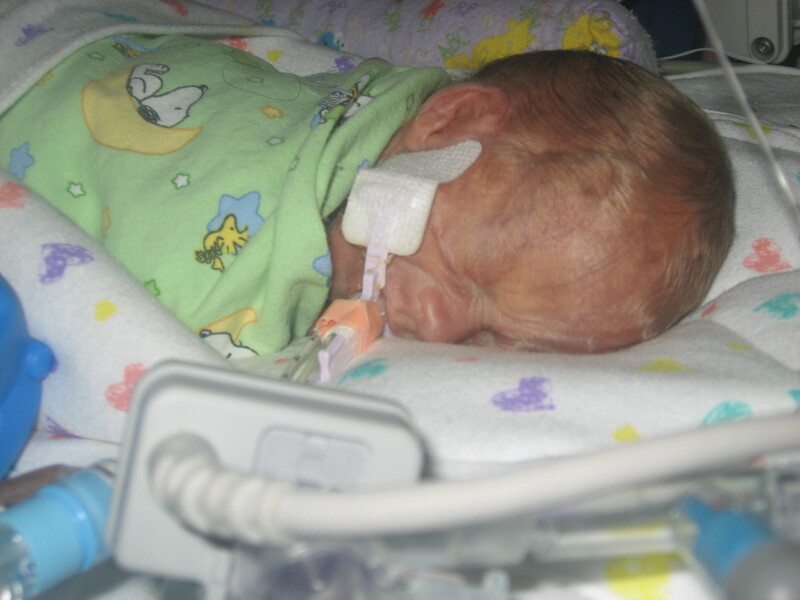 We are approaching a number that seems to mark much gain for most preemies, 1000 grams. That seems to be the golden number where weight is concerned. After reaching 1000 grams, the body kicks in and starts storing fats more adequately and babies begin to plump. Our pictures now must be reflected upon when that time comes, recalling just how tiny our little Champ was at birth. The next time you find yourself battling a case of the hiccups, remember that all hiccups aren’t just a disturbance to your day. For ones as small as Simon, hiccups mean so much more. Rob’s parents and I went down. The trip, as a whole, was fantastic. I thoroughly enjoyed the conversation and time spent together. Simon is officially up to 1 lb 12 ounces and is 28 weeeks gestation age today. He has moved from IV to Oral caffeine and as of tonight is 1mL shy of getting rid of the additional nutrient rich IV fluids. We should hit 8mL (the golden number) tomorrow evening. HOORAY! Simon also received a dose of Lasix today to help get rid of the fluid in his lungs. Hopefully this will do the trick and bring him back down to where he needs to be oxygen wise. He was in the 70’s a few days ago and in the 50’s again this morning. When we left the hospital today he was floating around 40% oxygen. Much improved.